The eye exists in a primitive state. The marvels of the earth a hundred feet high, the marvels of the sea a hundred feet deep, have for their witness the wild eye that when in need of colours refers simply to the rainbow. It is present at the conventional exchange of signals that the navigation in of the mind would appear to demand. Laura Aldridge, SIGNALS AND GET WET, 2016-17; DISPLAY SCAPE #6 FOR INVERLEITH: DROP.CLOTH (REMOVE SHOES AND COLLAPSE YOUR METONYMIC IMPULSE, REPLACE IT WITH A REFRESHED SENSE OF HOW WE RELATE TO THE THINGS AROUND US) (Detail), 2017. Courtesy of the artist, and Koppe Astner, Glasgow. When you visit an art gallery or a botanical garden a number of experiences are facilitated. You may be encouraged to actively explore new spaces to help understand the world in innovative ways instead of viewing objects, plants or paintings in a passive manner. Here at RBGE the exotic plants in the Front Range glasshouses are arranged in a series of glass zones, with varying temperature and humidity, for visitors to move through and interact with plants. It is designed in a way that stimulates the senses – touch, smells and taste- creating an experience that is not exclusively visual. Recently crowds gathered in Edinburgh not only to witness the rare spectacle of the world’s largest flowering plant in bloom, the Amorphophallus titanum, but to also to get the chance to experience the smell of its notoriously pungent odour. Described as similar to rotten flesh, the scent gives the plant its nickname the ‘Corpse Flower’ or locally now known as ‘New Reekie’. The smell is this plant’s way of attracting flies to increase the chances of pollination, demonstrating one of the ways that plants are able to communicate with the world. As Richard Mabey discusses in his book, The Cabaret of Plants, some plants even communicate with one another by releasing pheromones that humans cannot smell, ‘but which plants, noseless and brainless can.’ This is a hard notion to grasp when we limit our consideration to how human beings conventionally process information, as ‘an exchange of signals’ and processed by our perception. Installation view, Plant Scenery of the World, Lower Temperate Glasshouse, Royal Botanic Garden Edinburgh. Laura Aldridge, Samples and Straps, 2017. Courtesy of the artist and Koppe Astner, Glasgow. 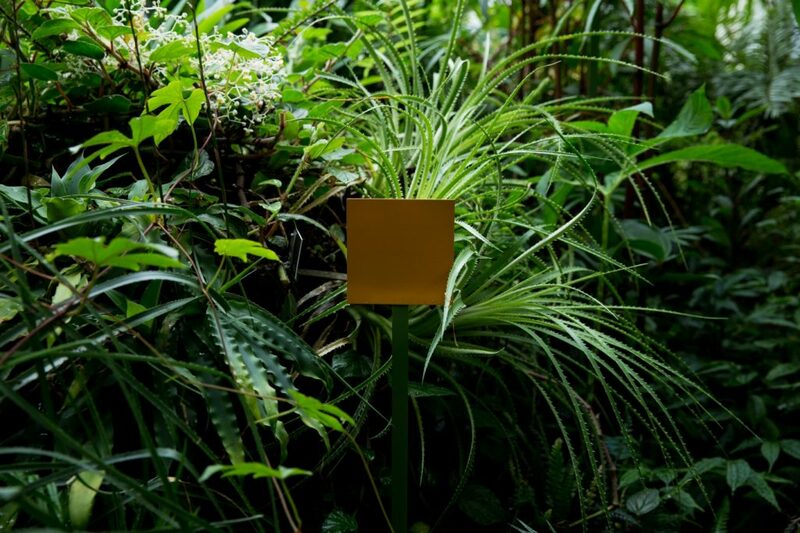 The current exhibition at Inverleith House, Plant Scenery of the World, interrogates the changing ways that Western culture has displayed and created new, but highly artificial spaces for viewing tropical plants, as an encounter of the exotic mediated by idealised and imagined visual images of faraway places. Plant Scenery of the World uses art and archival material as a vehicle through which viewers are confronted with a number of sense-based enquiries that question assumed universal truths, disrupt our perception and promote new ways of looking at and understanding plants and people. The exhibition takes its name from 19 surviving watercolour paintings by artist and botanist R.K. Greville (1795-1856). Greville was approached by his friend, John Hutton Balfour, who noticed that there was a lack of illustrated books on the subject of tropical plant geography. The project was conceived during the height of the British Empire and underpinned by Christian beliefs, connecting the project with ‘the prosperity of [Western] nations.’ Breton argues in his essay Surrealism and Painting that vision is ultimately the most powerful of all the senses because of its ability to ‘fix’ images which can then be transferred to a painting. Greville’s watercolours were produced having never seen any of the tropical geographies depicted. Instead he utilised archives, wrote to friends who were studying overseas and lifted ‘ready fixed’ images directly from books that existed on the subject. He also employed his imagination, which today comes over to contemporary audiences as an example of an outmoded and inward vision of the “exotic” seen (or literally not seen) from a Western colonial perspective. Even now what we interpret from visual images is often a product of learned social codes that vary from culture to culture. Laura Aldridge’s SIGNALS AND GET WET comprises of a colourful cluster of glass sculptures that take the form of a nazar. A nazar is an amulet that comes in the shape of an eye and is meant to protect the wearer from the curse of the evil eye, which can cause the victim misfortune, injury or poor health. In Turkish culture this often comes in the form of a glass eye bead, called a nazar boncuğu, and many visitors recognise the glass sculptures from the souvenir they may have bought whilst on holiday. Blown up and oversized in Aldridge’s room, the nazars are placed so that they cast a gaze in a number of directions, following the viewer as they explore the gallery space. Traditionally they come in blue, however the colours are meant to symbolise health, love, happiness and protection. The blue colour has deep symbolic meaning in Eastern Mediterranean culture but the other colours have been a recent addition – or gimmick – aimed for the Western tourist market. 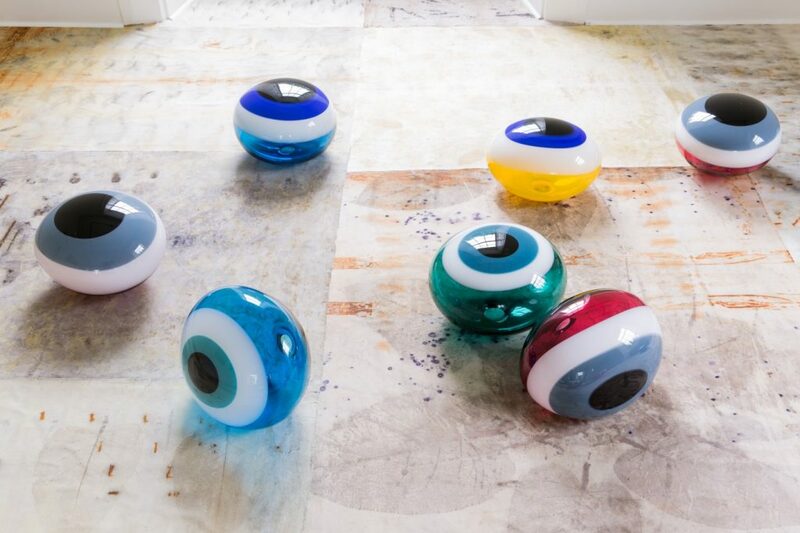 Aldridge’s glass eyes sit on top of a fabric floor which has been commissioned for this exhibition and is described as a sensory portrait of the glasshouses here at RBGE. DISPLAY SCAPE #6 FOR INVERLEITH: DROP. CLOTH (REMOVE SHOES AND COLLAPSE YOUR METONYMIC IMPULSE, REPLACE IT WITH A REFRESHED SENSE OF HOW WE RELATE TO THE THINGS AROUND US) uses exotic plant leaves collected from the glasshouses and processed into prints using a natural and experimental eco-dye process that cover the floor of the gallery space in its entirety. The viewer is invited to walk on the soft, delicate floor but to do so they are told by the artist to remove their shoes in order to participate with the work and experience it in a non-traditional way. The space therefore is investigated as much through touch and with the feet as it is using the eyes. Whilst you explore the work it returns your gaze, unlike Greville’s static watercolours. The work also physically demands the viewer to look down and consider new perspectives in a similar way that the signs in the Glasshouses instruct you to LOOK UP. Oliver Osborne’s Untitled (Upholstered Room) is another new work that has been made especially for this show and forces viewers to look twice and reconsider what they think that they are seeing. Paint splashes on the saffron linen fabric shift in the viewer’s perception from a sloppy error to intricate and beautiful embroidery which is skilful and worthy of admiration. 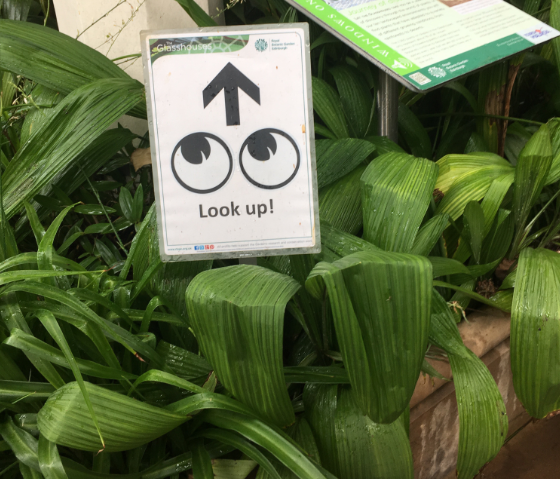 Photograph of signage in the RBGE Glasshouses. Human perception allows us to process information in a way that we can comprehend the world around us. When these signals become disturbed or ambiguous, as they do in Aldridge’s and Osborne’s installations, then we are confronted as viewers to rethink the ways that we see and how we interact in space. Contemporary art has the ability, literally in the case of SIGNALS AND GET WET, to stare back at you and force the viewer to see the world from a new perspective and rethink their ideas about other cultures and whether the visual is in fact a superior sense. Lastly, as instructed by Aldridge’s command to collapse ones metonymic impulse, the works here allow viewers to cast a critical eye over the ways we use our senses to interrogate and relate to spaces and images that we are presented with and to not be satisfied with substitute experiences mediated solely by the imaginations of others. Breton, A Surrealism and Painting in Painting in Harrison R. and Wood, P, Art in Theory 1900-2000: A Changing Anthology of Ideas, Blackwell Publishing, London 2003, p457-459. Mabey, R. The Cabaret of Plants, Profile Books, London, 2015. Andre Breton, Surrealism and Painting in Harrison R. and Wood, P, Art in Theory 1900-2000: A Changing Anthology of Ideas, Blackwell Publishing, London 2003, 458. Richard Mabey, The Cabaret of Plants, Profile Books, London, 2015, 309. For more details see essay by Henry Noltie in the gallery guide.